Get ready for a run on the trails that wind alongside Lake Fayetteville and along a pair of creeks that run through the heart of the city at the Fayetteville Firefighters’ Hero Half Marathon and Relay, which makes its 6th annual running this year, co-hosted by the Fayetteville Firefighters’ IAFF – Local 2866 and the locally-based Spark Foundation. Run along lakes, creeks and through the University of Arkansas. 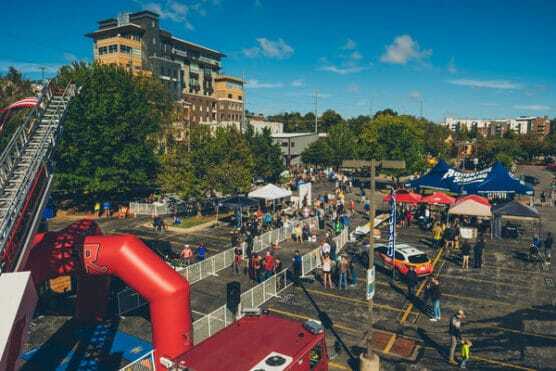 You’ll start the race north of downtown in this beautiful college town tucked away in the Ozark Mountains of northwest Arkansas, which lies a short drive from nearby Bentonville, the home of Wal-Mart. The starting line lies at the Lokomotion Family Fun Park on College Avenue, just west of Lake Fayetteville. Once you start the race, you’ll head up to Lake Fayetteville Road and then south along the Lake Fayetteville Trail, which features both paved and natural-surface stretches that wind around the lakeshore. You’ll run the Razorback Regional Greenway. The first half of the race will unfold entirely on these trails around the lake, and feature very forgiving, gradual downhill stretches (with a few hills), all of which are part of the Razorback Regional Greenway, a network of paved running, walking and biking trails throughout the city. 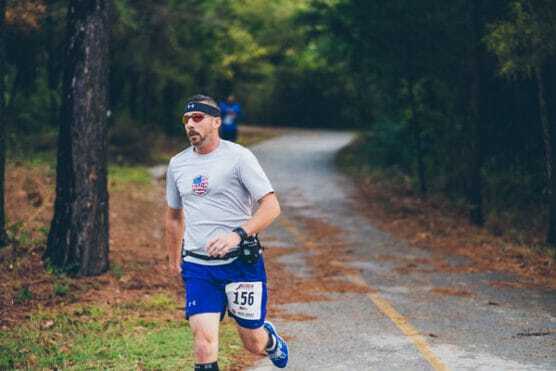 Shortly after passing the half-way point of the race, you’ll head out of the lake and onto the Clear Creek Trail, another paved trail that you’ll follow for roughly a mile and a half. At mile 8, just past the Northwest Arkansas Mall, you’ll make the turn onto the Scull Creek Trail, on which you’ll remain for the rest of the race. It will cross back and forth over the creek a few times along the way, until you reach the race finish line in the parking lot of the Walton Arts Center. Firefighter-themed finish line festival. 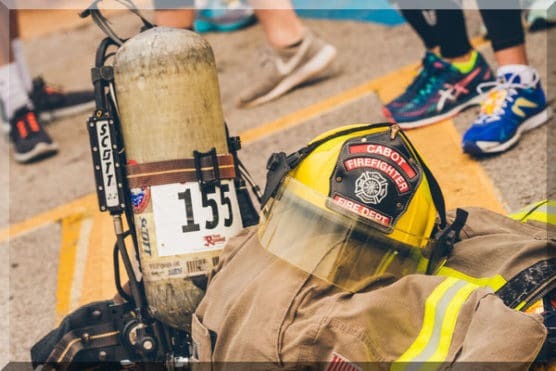 Once you cross the finish line — where there will be music, food trucks, a beer garden, and activities for kids — you can also meet and greet the firefighters who come out to volunteer for the race. The race also coincides with Fayetteville’s Fire Safety Week and features a memorial to firefighters who’ve lost their lives in the line of duty on September 11, 2001. Nestled among the foothills of the Ozarks in northwest Arkansas, roughly 190 miles northwest of Little Rock, Fayetteville typically sees mild to occasionally chilly weather in October, when temperatures average between the low 40s and the low 70s. On race day (Oct. 13), the average low is 48ºF and the average high is 71ºF. See the race route map for the Hero Half Marathon here. To reserve your spot in the 2019 running of Fayetteville’s Hero Half Marathon or Relay race, register online at RunSignUp.com here. 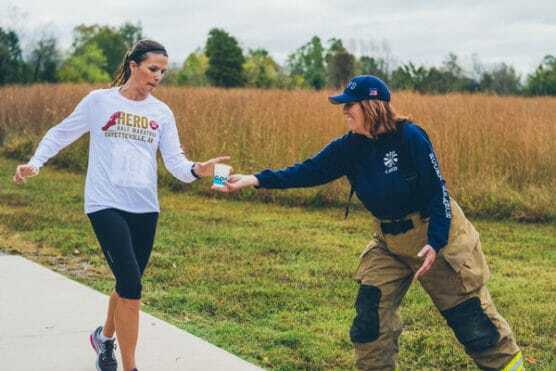 Ever run in the Fayetteville Firefighters’ Hero Half Marathon? Share your impressions here, as well as anything you learned about the race that you think other runners/walkers should know.